The book world has been abuzz since Amazon’s announcement of its new lineup of Kindle e-readers yesterday. And with good reason. Amazon has dropped straight through the supposed price barrier of $100 with two of its models, including one at the low-low price of $79. Each model has 2 prices: one with advertising, and a higher price if you want to just skip the ads. The excitement among authors and publishers comes from expecting that these new low prices—and with the holiday season just around the corner, and with every publisher now pushing out e-books as fast as possible—the time of the mass market acceptance of e-books is upon us. This is great for indie authors too. e-Readers like the Kindle are the ultimate democratic platform, open equally to big traditional publishers and the do-it-yourself solo entrepreneur author. With enough e-readers in play and lots of e-books to choose from, the e-book could be ready to take its place in the pockets and purses of people everywhere. Amazon also introduced its first tablet computer, the Amazon Kindle Fire, along with a new web browser and various techy “cloud” services that promise fast browsing and other advantages. The big surprise here is the price for the device: $199. This has set off speculation that the Fire could well be the first “iPad killer” to hit the market. A succession of companies, seeing the incredible sales of the iPad (29 million units at last count) have tried to bring their own tablets to market, each one failing miserably. Samsung, Dell, HP, Blackberry and others have crashed on the rocky shore trying to get to the green fields that Apple is cultivating. I’m not convinced the Fire is that big a competitor for iPad. Analysts say that the new family of devices will corral users into a tightly walled garden around Amazon’s content . . .
And consider the comparison: The iPad has a much bigger, higher-resolution screen, longer battery life, 425,000 apps in the App store, twice the storage, a camera and GPS capabilities. It has flown off the shelves precisely because it is so multi-talented, so gorgeous and such a pleasure to use. Amazon, on the other hand, which professes to be selling a “service,” not a piece of hardware, has a thicker, lighter machine with over 1 million books, Flash and Android. In the demo video below, you’ll see Jeff Bezos showing off the Fire at the announcement. He made it seem like watching movies, reading books, playing games and listening to your iPod, um, music player, on your 7″ device was a revolution in technology. Couldn’t you already do all that with a Samsung Galaxy Tab loaded with the Amazon and Kindle apps? In the second video below, you’ll see another hands-on short demo of the Fire. Notice the spectacular reflections off the high-gloss screen. No “So easy to read on the beach” TV ads for this baby. On the whole, I’m really excited about the spread of e-books. The more common they become, the more pressure there will be to make them better. The arrival of Amazon’s new e-Readers could well push us toward a change in the way books are presented to readers on these devices they love so much. And the Fire? I think the jury’s out. We’ve seen too many announcements like this one, also without any leap forward in technology, before. And who knows how Apple will respond? Remember that when the iPad came out, at half the expected price, Amazon had to slash the price on its Kindle immediately. There have been rumors for months about a 7″ iPad, and if it can do everything the iPad2 can do, and sells for let’s say, $249 to $299? Apple does have a lot more experience in the hardware business than Amazon has. Besides, didn’t I hear something about the iPhone 5? Now that sounds exciting. If these don’t show up, try re-loading the page. So what do you think? Is this a big day for indie authors and e-book lovers? Do you think the Fire is the next great thing? I honestly don’t see Apple worrying about the Kindle Fire as they recognize exactly what Amazon is marketing it as, a gateway, albeit a very nice gateway, to Amazon and all of the electronic media (as well as all other consumer goods) they have to offer. Anyone thinking that it is being marketed as a tablet is looking at it the wrong way. The Fire is far from an iPad killer as it is a totally different class of machine. With that being said, I do believe that the price of the Fire will prompt a lot of tablet fence riders to come on down off the fence. Exactly! Plus a “free with Prime option” could change the whole game and give Amazon another push at its real competition, Walmart. It would shock me if we do not see the Fire and Prime come together more than the current one month free Prime with Fire purchase. If any company could do it like that (2 year Prime = free Fire), Amazon has the business to do it. 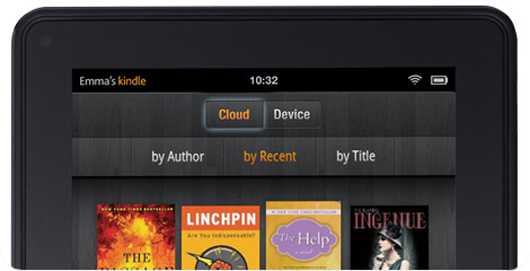 The interesting possibility will be if Kindle Touch &/or Fire comes free with a 2-year contract for Amazon Prime. That could ramp it up a lot. What I think this will do is bring the tablet down to the regular consumer more. To date, most tablets cost hundreds of dollars, so for the average Joe who has trouble carving out an extra $100 or $200 from their budget, they were long out of reach. With a decently good tablet at $200, you’ll get those who that’s all they can afford (like I was) or those who are willing to save a few hundred so they can buy more books to put on the thing, if they feel they aren’t losing that much by buying the Fire instead of the IPad. IOW, I’m not sure the Fire will eat into the IPad too much, though I’m sure it may make a dent, but I think it will bring a lot more people into the tablet market as their entry level device. If they are unsure what they would use the tablet for, this is more appealing to risk only two hundred instead of four hundred or more on most every other tablet out there, save the Nook…which this will threaten the Color Nook more than the IPad, in my opinion. Nook will either have to lower their price to match, or watch as sales go over to Amazon. and I’m guessing Amazon is betting that B&N can’t sell it at two hundred without taking a loss. With over 30 million iPads in 64 countries–and about half of Apple’s iPad sales in other countries–Apple can’t sell iPads fast enough, at all price ranges (and it’s more expensive outside the US). They’re on track to have sold about 50 million by end of Q1 2012. The Fire is a retail shopping device. The entire interface is geared towards driving consumers to Amazon.com. The iPad is an entirely different kind of tool. Importantly, the iPad is as much as creating as it is consuming. the Fire? Passive content consumption, period (and Amazon’s losing a reported $50 per sale to get it out the door). The number I heard reported was they were losing around $10 on each one, which they expect to make back up in increased content sales. And that is probably likely. One angle on this I read about recently is that by nudging in the door with this lower scale tablet compared to the IPad, they know the IPad people will think as some here, “This isn’t a threat.” Then they start adding features that make it more and more like the IPad, carrying their large gateway base with them, and edging in on the upper IPad market. Don’t know if that is there plan, but I could see that happening. By the time Apple realized what was going on, it would be too late to counter it effectively. But they may already be getting a jump on it if they offer up a lower-end IPad as mentioned here, to head off Amazon’s tablet being the only gateway tablet of significance. I am beyond excited about the fire. I publish Childrens ebooks and this is the technology we’ve been waiting for. Yes, people do view our books on iPads and android devices, but the kindle store integration will be a game changer for us. I’ve not jumped on the iPad wagon (although I tend to *love* Apple products) I’ve just not seen anything that could justify the cost and I’m not sure how I’d use it. With that said, I’m giving serious consideration to the Fire. Trading in my current Kindle for the Fire and having additional functionality makes it quite attractive – especially for the price. Oh, and don’t think I’ve forgotten about that guest post. Hopefully to you this weekend. Good point, George. The Fire is a great upgrade for Kindle lovers who want more functionality, and the price is really attractive. I know that when I bought my iPad I had no idea what I was going to use it for, but felt I had to stay on top of the development. Now, I use it daily for lots of tasks and would dread giving it up. Good luck with it! For it the convenient porbatle size of books movies and there are several good reasons for it the low price of 199 the low price of books movies and rich catalog of books movies and rich catalog of books movies and rich catalog of books movies and there are several good.For it the low price of books movies and rich catalog of books movies and music offered through amazons kindle fire.The low price of 199 the low price of books movies and there are several good reasons for it the first successful tablet not sold by apple.The first successful tablet not sold by apple and there are several good reasons for it the convenient porbatle size of 199 the. I really don’t want all my browsing to go through the Amazon cloud, with their ability to retain every move I make online! The questions of privacy surrounding the new Kindle are absolutely horrendous! NO THANKS! I pre-ordered one for my wife. I’m excited about this platform and the book I’m working on now will be converted into and ebook to take advantage of this growing market. I was just reading about this yesterday. It’s good that Amazon is bringing out out their own tablet but I believe they’ll do better than Apple’s other competitors that went the way of the Hindenburgh. First of all, Amazon has an immensely large buyers platform. If you combine that with their their huge inventory of products, this would allow Amazon to sell their tablet much cheaper than the iPad, since they can depend on the sales of their own merchandise to make their profits. Unless Apple slashes the price of their iPad, they may end up loosing customers with the exception of their true fans.